Our Founder and Director, Andy Snell, met with Bunbury Aldersey CE Primary School to discuss plans to introduce an all-season Daily Mile Track to their outdoor play area. The Daily Mile Track has several great benefits for school children. Research demonstrates that children who are physically active show improved concentration in lessons. Exercise also helps children to de-stress and boost their mood. We installed a pathway in a loop with lush, green artificial grass. It is 166 metres in length and 1.2 metres in width. The distinct trail delivers a clear, focused zone for children to workout. 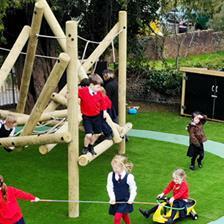 Artificial Grass is a fantastic base for children to run, walk and be physically active all-year-round. It imitates the appearance and texture of natural grass, short of the muddy mess and upkeep. Artificial grass is an excellent choice due to its robust and hard-wearing characteristics. View our Daily Mile Track options here. As you can see from the pictures, it merges well with the neighbouring natural grass, too. Regardless of the weather conditions, the children at Bunbury Aldersey CE Primary School can benefit from taking the daily mile challenge and feel reinvigorated and energised. 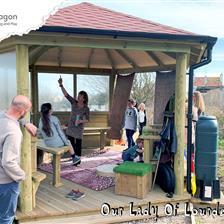 Its multi-use quality allows children to use it before, during breaks and after school. The Daily Mile Track can also be used as a learning resource to help children understand distance, for instance how far a metre, half a mile, kilometre and mile is. It is perfect for PE lessons, sports day races and training, too. We have had lovely feedback from Bunbury Aldersey CE Primary School. The energetic school children are delighted with their fresh and vibrant Daily Mile Track. 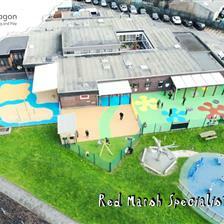 If you are looking to install a Daily Mile Track to help children have a focused and dedicated area to improve their fitness levels, mood and concentration, please Contact Us at Pentagon Play for expert advise and a free consultation. Alternatively, if you’re looking for new and exciting ways to spend your Sports Premium, view our Sports Premium Page here.